oil pastel. 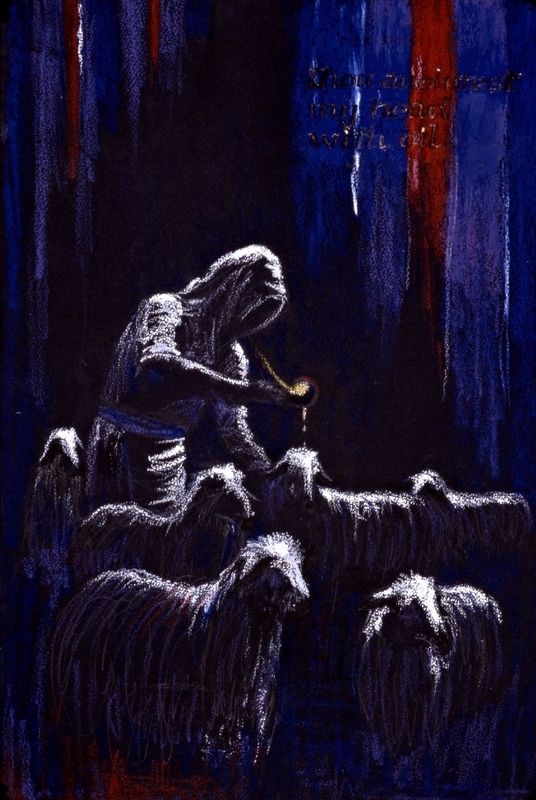 The inspiration for this painting was an actual photograph taken in Israel during the 1940’s of a shepherd pouring oil on the sheep under his care. Oil was used on the sheep to keep bugs away and to help wounds heal. It is a practice that continues today. The act of anointing with oil is important and deeply symbolic in the Bible. It was done as a mark of respect, during inauguration into a high office, for soothing and curative effects, cosmetically after bathing, and as a sacred preparation for burial. In the New Testament we are instructed to anoint with oil during prayers for healing. The words “Messiah” and “Christ” mean The Anointed One. Oil is also used as a symbol for the Holy Spirit. Our Shepherd, the Lord Jesus Christ, anoints believers with the oil of the Holy Spirit in much the same way it was used for the sheep – for our protection and healing, our sanctification – as the Word says we are sealed with the Holy Spirit when we believe. Jesus has said that believers who ask will also receive the baptism (or additional anointing) of the Holy Spirit to receive His supernatural gifts and move in His power for His purposes and glory just as the disciples did at Pentecost. The background in this painting is blue, purple and scarlet, the colors ordained by God to be used for the curtains in the tabernacle built in the desert by Moses and the Israelites. In the painting, above the Shepherd’s head, the curtain is torn in two just as the curtain of the temple was torn when Jesus was crucified. It was not until after I had finished the painting that I saw God had directed me to paint the curtain torn in two, symbolizing the entrance Jesus has given us into the Holy of Holies.